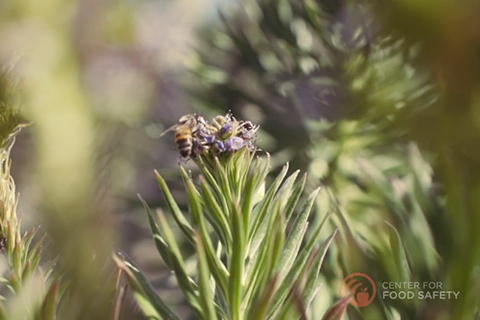 Musician, DJ and activist Moby takes us on a tour of his four-acre property atop the Hollywood Hills, which he shares with approximately 30,000 healthy, happy bees. Many of the foods we eat are dependent on honeybees for pollination. In fact, they are responsible for one in every three bites of food we eat. We depend on bees more than we may realize. Over the past decade, honeybee populations have experienced an alarming decline. This is partly caused by habitat loss, parasites and diseases, but scientists have found that our systemic use of toxic pesticides are a primary contributing factor — one that we must do something about before it’s too late. Bees are directly responsible for one in three bites of food we eat. To protect our pollinators, we need to start shifting away from pesticide-intensive industrial agriculture and more towards more sustainable methods of organic and ecological farming. In April, the European Union declared a two-year ban on certain neonicotinoids — the most toxic pesticides — to see what effect it will have on the bee population. If the E.U. can do it, so can we. Help put pressure on the U.S. government to follow Europe’s lead and suspend the use of bee-killing pesticides. When shopping for plants for your yard or garden avoid plants that aren’t organic as many of them are pre-treated with chemicals that are harmful to bees. Buy organic food as much as possible to support farming methods that avoid bee-toxic chemicals and pesticide-promoting genetically engineered crops. Even if you’re afraid of bees, even if you don’t like bees, we need them. They enable us to live. They enable us to eat. Stand with Moby to save our bees.